A tremendous comeback by J.T. Barrett and the Buckeyes. The No. 6 Ohio State Buckeyes are back in the College Football Playoff race after rallying to defeat No. 2 Penn State 39-38 in Columbus. Make no mistake about it: this was an impressive victory for Urban Meyer’s squad. After all, Penn State entered the game as one of the most complete teams in the country. The Nittany Lions’ defense was ranked ninth in total defense, third in yards per play, and first in scoring defense heading into Saturday’s action. The offense was every bit as impressive, featuring Heisman Trophy frontrunner Saquon Barkley and ultra efficient quarterback Trace McSorley. With weapons like that on both sides of the ball, the Buckeyes would need to turn in an outstanding effort to earn a victory. Don’t get me wrong: Ohio State was far from perfect in this game. Barkley returned the opening kickoff for a touchdown, putting the Buckeyes behind just seconds into the contest. By the time most fans went into the kitchen to grab a soda, Penn State was up 14-0 after a fumble return gave the Nittany Lions first-and-10 at the Ohio State 23. The Buckeye offense followed that up by going three-and-out, settling for a field goal inside the red zone, and getting stopped on downs on its next three possessions. Although Ohio State would eventually get its offense going, Penn State answered every Buckeye touchdown with a score of its own. Once OSU fumbled the ball its own territory in the fourth quarter, it looked like it wasn’t going to be the Buckeyes’ day. Rather than give up, Ohio State adopted Gunnery Sargeant Tom Highway’s approach (improvise, adapt, overcome). The Buckeye defensive line repeatedly stopped Barkley behind the line of scrimmage for a loss. They absolutely owned the final minutes of the contest, limiting Penn State to -10 yards on its final 10 plays of the ball game. While the defense deserves a shout out for giving the Buckeyes a chance to win, the game ball has to go JT Barrett, for leading the team to victory. Instead of listening to the “pundits” in the blogosphere who said that he couldn’t win the big one, Barrett showed us why he belongs in the Heisman Trophy conversation. The senior completed 33 of 39 passes – including his final 16 attempts – for 328 yards and four touchdowns. Barrett also did a great job of running the ball, ending the evening with 95 yards on 17 carries. So what does this win mean for Ohio State going forward? Simply put: it makes them a contender to win the national championship. Sure, the loss to Oklahoma still stings. 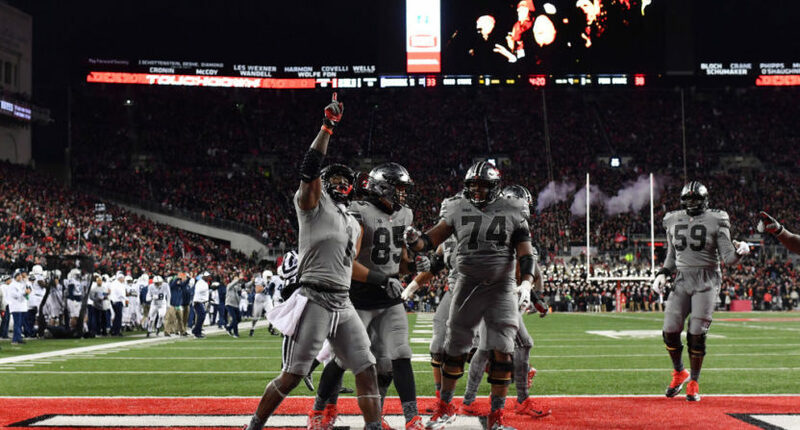 But, much like the national championship team of 2014, Ohio State grew from the loss, and proved that it is capable of beating anyone when it is playing well. The Buckeye defense displayed the swagger and nastiness needed to stop a power running attack like Alabama, Notre Dame, or Clemson. Similarly, Barrett and the offense reminded us that the OSU offense is explosive enough to win a shootout against a Pac-12 or Big 12 opponent. If that doesn’t sound like a team that has all of the tools to win it all, I don’t know what does.